On this feast day of St. Mary Magdalene, the apostle of the apostles, the Gospel invites us to draw inspiration from Mary Magdalene who proclaimed LIFE from the TOMB, which is a place of Death. Drawing a comparison between Eve, who “spread death where there was LIFE (Paradise), and St. Mary Magdalene, who “proclaimed Life from the Tomb, a place of death”, the Archbishop Roche once said that Mary Magdalene is a lesson for all Christians to trust in Christ who is Alive and Risen. Mary Magdalene is one of the first witnesses of the Resurrection, the one who brought the news of the empty tomb and one who, later on, announcing to the disciples, ‘I have seen the Lord’. She does not reserve that message for herself but she proclaims it to all – a real witness for all who desire to imitate Christ, the Risen. Another interesting thing that we see from the part of Jesus too, is that He does not allow Mary to cling on to Him rather sends her on a mission – to proclaim the LIFE-GIVING message of the Resurrection, the story of the EMPTY TOMB, to all. It is an invitation for all to be born anew in Faith, more Alive and Strong than ever because Pope Benedict XVI would say that the Risen One does not belong to the past, but is present today. Therefore, there is no more space for mourning but rejoicing. But sometimes tears too permit us to see Christ. The reason is, as Pope Francis says that her tears at Christ’s empty tomb are a reminder that “sometimes in our lives, tears are the lenses we need to see Jesus”. 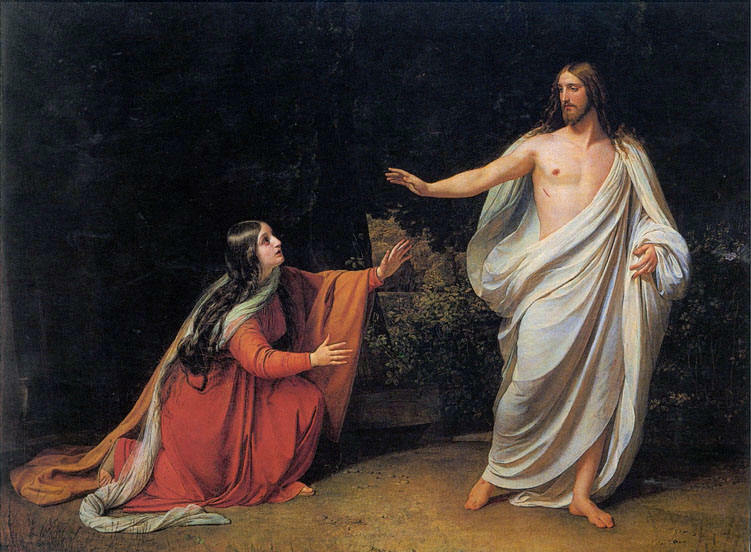 Reflect, today, as we celebrate the feast of St. Mary Magdalene, whether do we possess an ardent zeal to possess Christ and to proclaim Christ as Mary did; whether do we bring LIFE even when there is still the shadow of Death. If not, let us resolve to proclaim LIFE from the TOMB. Amen.